Did you see yesterday’s post? Well, here’s a slight variation. P.S. I would love to see pictures. So if you make an apron, or any other project, please show me. I love to see everyone’s work. It makes me smile. SOOO CUTE! I can’t wait to get makin’ this!! So glad this will work out for you guys. Pretty fun apron. So Jodi……I responded to Janine in the last post and so I’ll just copy my answer from there. Most people probably won’t notice it so here it is again. Janine – I just browse stores when I am in the area. Joann’s, Hancock’s, Porter’s (only local), and sometimes little local stores when I’m visiting other states. You know, fabric stores are always rotating fabrics and so it really depends on the time of year. So I always browse and sometimes I’ll just buy a half yard here or there and stash it away (bad habit). But gosh, I don’t really buy anything online. They seem to cost more and I don’t want to pay for shipping. I do however, really like http://www.purlsoho.com/purl Cute stuff. Does that help at all Jodi?!?! ANyway, can’t wait to see some of the stuff you’re making….go on, send me a picture!!!!! Your blog is adorable!!! I’m so glad I ran into it! I got here because I was looking for a tutu pattern. Yours is seriously adorable. 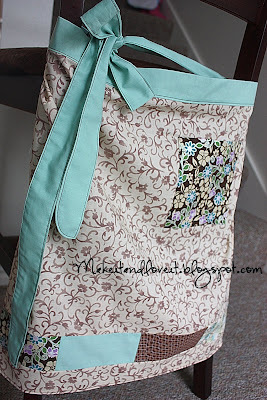 I love blog hopping, and crafting, and I already want to try out everything you’ve made!! I’m no professional, I just like creating and working with my hands. THANK YOU for sharing!! we are selling aprons any one interested?